After the devastation of Atlanta during the Civil War, the city began to rebuild itself around the railroad tracks that brought goods and people to the city. However, by the 1920s, Atlanta had a growing traffic problem. A series of viaducts was built to bridge the railroad tracks and relieve congestion in the downtown area. The viaducts illustrate a dramatic early 20th-century chapter in local transportation and were part of a largely unrealized City Beautiful plan to fashion a Beaux Arts civic center above the railroad. Atlanta continued to grow above these viaducts--and above the original street level of the center city. The ground floors of these buildings, essentially sealed off by the viaducts, reflect the typical architecture of this period. Those that front Alabama, Pryor and Peachtree streets remain the most intact examples. These post-bellum business blocks were abandoned for decades, but were rediscovered and redeveloped as a shopping and entertainment district called Underground Atlanta in the late 1960s and early 1970s. Today they remain a distinct, urban environment. 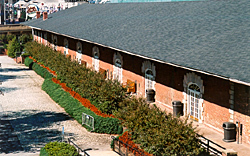 The storefronts along the north side of Alabama Street are the surviving lower portions of buildings that were demolished to make way for the MARTA rapid-rail line. Most of the storefronts in Underground Atlanta date from the late 19th and early 20th centuries, and are generally Victorian in style. Within the district is also the Zero Mile Post, which marked the beginning point of the State-built railroad line that fostered the development of the city. 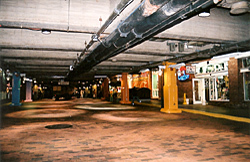 Underground Atlanta, a shopping and entertainment district, is open to the public during normal business hours. For further information visit their website.